When in doubt always reference the almighty color wheel! If your beacon of perfection is makeup, take the makeup and swab it onto a piece of white paper. If it is one of our minerals, take a bit of water and your lip brush and paint it on to the piece of paper. Then look for the dominant shade- red, red purple, yellow red, yellow, and so on. If it is fabric or jewlery than look for the shade that most stands out to you. Then locate the dot of color where your makeup/fabric hangs out. There are several options to choose. The analogous color scheme uses colors that are next to each other on the wheel. Your makeup/fabric color is the dominant color, while the others are used to enrich this color. These two colors will be on either side of your dominant color- think of them as the groupie colors. This color scheme consists of only two colors that are on opposite sides of the color wheel. The color scheme relies on high contrast so if your dominant color (makeup/fabric color) is Red than the opposite would be Blue-Green. Mapped out it will appear as a straight line from one color to the other. The split complementary color scheme differs from the complementary in one respect, it takes your dominant color and the two colors adjacent to its complementary. So using the previous example, if your dominant color is Red than the two split complementary colors would be Green and Blue-Green. It resembles a fork in the road when you map it out and is a little softer than the complementary color scheme. This color scheme uses three colors as well, though they are equally spaced around the color wheel instead of adjacent or forked across. The Triadic color scheme is good when you want to add strong visual contrast while retaining harmony and color richness. It looks a little more balanced when compared to the complementary color scheme. Using the same dominant color we have been using (Red) the two triadic colors would be Purple-Blue and Green-Yellow. It looks like a peace sign when you map it out. These four colors schemes can be used to really make that Compliment Inducer pop! Just take the colors and find the right makeup or clothing to match it. Now we realize that some people just don’t have the time or inclination to sit down and map out the colors that go with thier Compliment Inducer and proceed to find the right makeup that matches those colors. So don’t bother with it, just send a swatch (or if it is an eb product-the name) to us and we will send you back a complete face look with samples. You can even specify if you are looking specifically for an eyeshadow, a lipstick, or a blusher. Under Shop Categories click My Custom Blend and locate My Color Path or just click here. When purchasing (just $7.50 folks) make sure to include the name of your eb color, or send us a small swatch of what you are looking to match (you can drop it off if you are local). If it is a non-eb color, send us a dime sized dot and mail it. 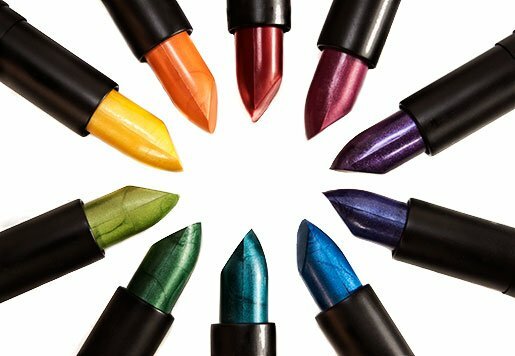 Tell us if you are looking for something specifically (eyeshadow, lipstick, blusher) and if you want it to be high contrast, soft, or match in the notes section at check out- and we will find the colors for you. We will then send you a complete face look with samples so you can try it for yourself. Obviously feel free to call us if you have any questions. We are mad for color and will have our Coloristas find the perfect scheme for you!